The Captain automatically called for the door to open. She had no doubt as to the identity of her visitor. She had been in the ready room for hours and was surprised it had taken this long for her First Officer to stop in. Kathryn smiled as she watched him make his way across the room. Voyager had been stranded in the Delta Quadrant less than six months but they had grown very close in that time; the staunch Starfleet captain and the Maquis rebel. As Captain, she had instinctively trusted him from the very beginning in spite of their differences, and her respect and admiration had grown with each crisis they faced together. Their professional relationship solidified quickly and their friendship had blossomed from there. Now she found herself wondering how much deeper her own feelings ran. "What’s this?" Looking up to find him watching her, Kathryn motioned toward the bundle he carried and she tried to hold down her blush. "My medicine bundle." Chakotay hesitated then graced her with his best, dimpled grin. "I’ve never shown it to anyone before, but after what we talked about this morning, I thought it was important to let you see it." "Will it help me find my animal guide?" "Eventually, you will have to assemble your own medicine bundle, but this will allow me to assist you in your quest for a guide." Chakotay motioned toward the more open space on the upper level. "Now?!" The Captain was shocked that he wanted to show her now, while they were still on duty, his quick nod and sheepish smile quickly changed her mind. "Now!" She smiled and nodded back. Chakotay moved to the upper level, unfolded the small bundle on the coffee table and sat on the floor behind it. The Captain watched from behind her desk, laughing when she realized he expected her to join him. Kathryn took a seat on the floor beside him. “A feather from a black bird’s wing, a stone from the river, an akoonah." Chakotay carefully picked up and studied each item as he named them for her. "My ancestors used psychoactive herbs to assist their vision quest." He explained as he showed her. "Now, they are no longer necessary. Our scientist have found a more modern way to facilitate the search for animal guides." Chakotay arranged the articles on the table, moving the akoonah directly in front of her. "Place your hand on it and concentrate on the stone." Kathryn reached out, tentatively placing her hand on the strange device as she focused her mind on the carved river stone. "Acoochie moyei. We are far from the scared places of our grandfathers. We are far from the bones of our people, but perhaps there is one powerful being who will embrace this woman and give her the answers she seeks." Chakotay watched Kathryn's concentration. "Allow your eyes to close." He spoke in a soft soothing voice, as her eyes drifted closed. "Breathe to feel the light in your belly and let it expand until the light is everywhere. Prepare to leave this room and this ship and return to a place where you were the most content and peaceful you have ever been. You can see all around you and hear the sounds of this place." "Good, but you must not discuss with me now what you see or you will offend your animal guide. As you continue to look around, you will become aware of other life that shares this place with you. It will be the first animal you see. That is the one you will speak to. Do you see an animal?" 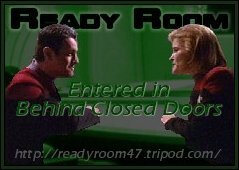 The slight swish of the ready room door sliding back caught Chakotay's attention. As he looked up, he raised his finger to his lips so the intruder would not interrupt Kathryn's vision quest. B'Elanna stopped just inside the door and nodded. Seeing Kathryn had not been disturbed, Chakotay moved quietly away and led B'Elanna back onto the bridge; the door closed behind them. Chakotay's voice faded as Kathryn studied the tiny green lizard-like creature that moved slowly across a fallen log. For several seconds they silently sized each other up. With those few words the lizard slithered down from the log and scurried away into the brush. Kathryn watched the brush fall back into place behind the lizard before realizing she should have followed. “Where are you?” Kathryn called out as she tried to follow the trail. A noise in the distance drew Kathryn’s attention. Footsteps, too heavy sounding to be the lizard, not heavy enough to be another person. Kathryn followed it. Cautiously, she went through the brush, holding back and ducking beneath the low lying branches as she went. Kathryn pushed past the large low branches and found herself in sunlight so bright she had to shield her eyes to see. Once her eyes adjusted to the light, Kathryn searched the clearing for the source of the noise. Finally, she spotted it. Stretched out on a rock basking in the sunlight that made its deep orange coat almost glowing was a cat. As Kathryn approached, the cat lifted its head studying her with wide round eyes in a rich chocolate color. Kathryn shrugged. Perhaps this was only a cat after all and she was just getting carried away with Chakotay’s spirit guide stories. Chakotay drew great comfort from his spiritual beliefs and vision quests and she had spoken to her own guide, but that was no reason to think every animal she encountered would have the ability to communicate with her. The dark eyes followed her movements. Kathryn sensed intelligence beyond feline, but the cat never answered. Kathryn shook her head as she turned back toward the woods. She was taking mystical journeys and apologizing to cats. What had this man done to her? “Chakotay, I love you, but I think you are making me crazy.” Kathryn chuckled to herself as she reached to move the first branch from her path. The smooth soft voice caught Kathryn off guard; she whirled back toward the clearing. The cat was no longer there. In its place sat a woman, her long black hair streaked generously with white, her body lean and sturdy in spite of its age. As Kathryn watched silently, the woman stood and moved closer. "Chakotay already makes my duties much easier." "Your first officer shares the burdens of the captain, yes. Now, you must decide if you will allow Chakotay to stand beside Kathryn." “I have only known Chakotay a few short months and..” Kathryn made a second attempt to sidestep the question. “I love Mark.” Kathryn’s tone was clearly defensive. “This is crazy. I am a Starship captain and now I’m talking to a vision about my life.” Kathryn shook her head and turned away. “It is enough, Kathryn. You see the words are not as important. I will share with you the advice my mother gave to me, advice that I have passed to my children and hopefully they will pass to theirs- Place you fate in the hands of a gentle heart." Karnimya smiled as her image began to fade. "Look into your heart and embrace your future." Kathryn found herself alone in the clearing. Suddenly feeling chilled and strangely drained, she stretched out on the soft grassy surface and closed her eyes allowing the sun to warm her. “Kathryn?” Concern was evident in the soft smooth voice. “Karnimya?” Kathryn mumbled as she struggled to open her eyes, the voice was the same— no, deeper. “Kathryn, it’s me. Are you all right?” Chakotay placed a gentle hand on her shoulder. “Chakotay?” Her eyes opened to the familiar concern in the deep brown pools that studied her. “Yes, I’m fine.” Kathryn smiled and placed her hand over his. “Not exactly. It was a little unsettling at first, but I think I understand now.” Kathryn moved from the floor to the couch. “Will you sit by me a while?” Kathryn patted the cushion beside her. Kathryn smiled looking away to keep him from noticing the rising color in her face. She knew the words were true. He has told her in so many ways and always she avoided a response. “You didn’t frighten him, threaten him in some way?” Chakotay smiled remembering how the last friend he had introduced to her spirit guide had reacted. “Yes, I often sense what my guide expects of me.” Chakotay grew more serious. He settled back to wait out her silence, enjoying the feeling as her fingers tightened around his before she continued. "I'm glad you found comfort in your vision quest. I can help you assemble your own bundle, if you'd like." Chakotay wondered briefly if he were presuming too much, but she smiled and nodded. "I would appreciate that." Kathryn rested her head against the back of the couch and closed her eyes. "Place you fate in the hands of a gentle heart." She whispered to herself. "Kathryn?" Chakotay was surprised to hear her repeat the advice his mother had given him. "It’s something I learned today." Kathryn raised her head and smiled. "Is it ever possible take these quests together?" "It's unusual but people with a strong bond can sometimes share a vision quest." "Will we need a third bundle?"